The Metropolitan Executive includes: Faux leather and canvas tray, Special toffees, cherry bon bons, Ghirardelli caramel filled milk chocolate squares, butter toffee caramel corn, Merlot cheese spread,, old hickory Wisconsin cheese triangle, Chamberry French truffles, Deluxe mixed nuts, chocolate cream filled wafer cookies, chocolate cream filled Pirrouline wafer cookies, salty dipping pretzels, butter toffee pretzels, 7 oz salami, Almond Roca toffee, Cucina bistro style olive oil chips, Bellagio latte mix, Bellagio cappuccino mix. 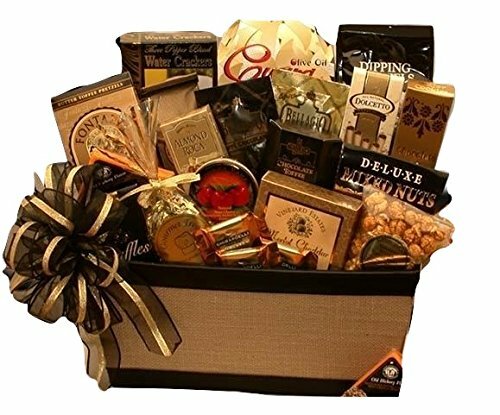 Topped with an attractive gold and black hand made bow this gift makes a stylish presentation. This gift measures 14" long by 8" wide by 14" tall and weighs 5 pounds when complete. View More In Cheese & Charcuterie Gifts.